At L&E, we think nothing is cooler than computer guys. We will afford instant hero-worship to anyone we see wearing the computer geek uniform: short-sleeved button-down shirt (pink), pocket protectors, and tool belt bearing 150 beepers. Even cooler than that uniform is the off-duty geek look: a T-shirt with a cryptic cybermessage meaningful only to the intellectual elite, like "Got source?" or "My data bus ran over your bogoMips". We'd really like to make some cool, funny techie Ts, but the thing is, we don't really know that much about computers. 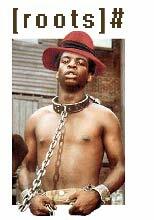 If you can ignore the primary association, about the harrowing African-American experience and the evils of slavery, you can unpack a minor joke about the unix command line. This shirt will appeal to anyone who is entertained by depressingly obvious observations about the funny little pictures on the keyboard, or have a short friend named "Carriage Return". This shirt is for the Unix fan in all of us. 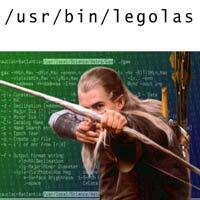 We've all wondered -- what's up with the mysterious /usr/bin/legolas directory? Does it have any relation to the loveable elf from Lord Of the Rings? What's inside? Is it the treasure of the dragon Smaug? The ultimate in exclusionary geek humor, this shirt is not only unintelligible to anyone who didn't play a lot of Dungeons and Dragons as a child, but also to anyone who didn't read this article. 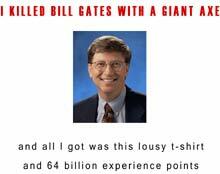 WARNING: Do not wear this shirt if you really killed Bill Gates, lest it be deemed a "clue".